But this year, on the prairie, April showers are either sleety rain, come in thunderstorm form, or are hail!!! It's been cold on the prairie this April! And so warm soups seem like good dinner fare! We've taken to eating dinner in the dining room of late. Seems a shame to not use a room especially when Linderhof has so few of them. 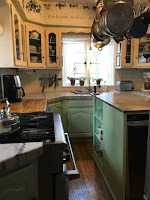 And although for most of the time we've lived at Linderhof all of our meals were taken in the dining room, once we built the breakfast room, we neglected the dining room. 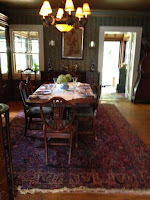 Dinner is in the dining room! 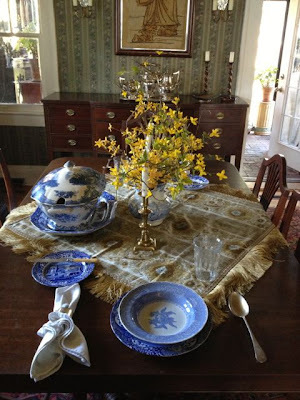 And for this cold April evening, it's a soup "supper"
Of course, the table is in blue and white! With the pitcher of forsythia from the garden as a centerpiece! It's so pretty, will hate it when it's gone! It's perfect for serving the supper soup! 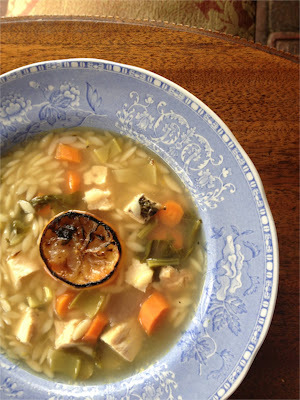 Which is my version of Panera's lemon chicken orzo soup! It's really good and although hearty seems more springy than a lot of soups! 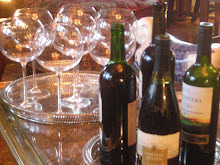 It's Thursday and I'm joining Susan at Between Naps On the Porch for Tablescape Thursday and Cuisine Kathleen for Let's Dish. This sounds delicious and would be perfect here with the 4" of snow at our house yesterday! Hot soup and bread - wonderful! Yummy! 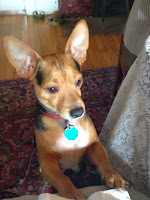 I love soup suppers too. And it is to beautifully and elegantly presented. 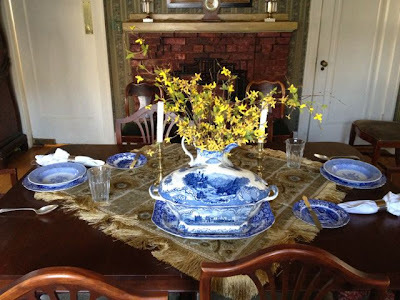 I love the visual appeal and I am always partial to blue and white transfer ware. The tureen is lovely! Soup has been the bill of fare here, too! Gorgeous tureen, Martha. Your soup is making me so hungry this morning! I could eat soup twice a day (not for breakfast, though!!). 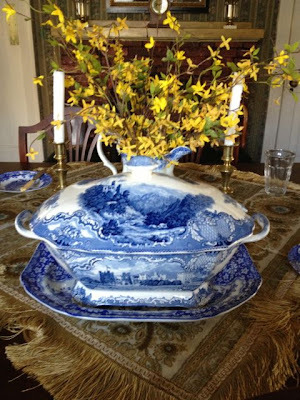 I cannot believe your gorgeous tureen find - I have never found a deal that wonderful! Beautiful table - I love blue and white! I love the soft blue of the Spode Camilla with the contrast of the Spode Italian in your place settings!!! Striking forsythia centerpiece!!! Soup was served at our May Day Brunch here on the Praire, for we had rain, sleet and SNOW on that day, as well!!! I have that tureen. It's beautiful!! !You got a great deal. Not Your Average Mother's Day Dinner . . .
May Day . . . May Day. . .